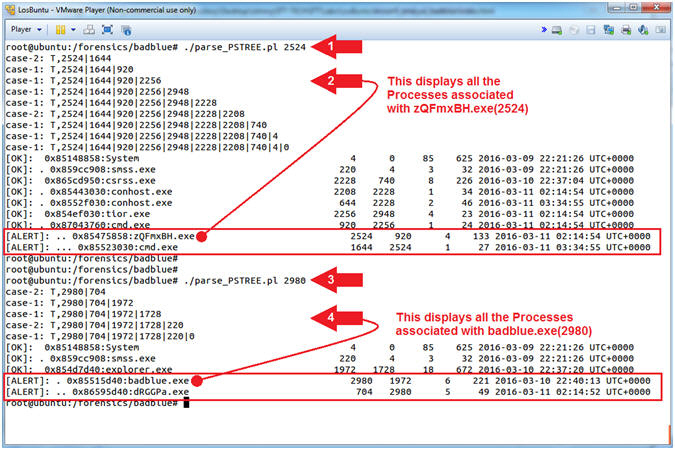 The following lesson shows you how to take memory analysis one step further, by identifying if a Meterpreter session is attached to an exploited process and/or remote connection. 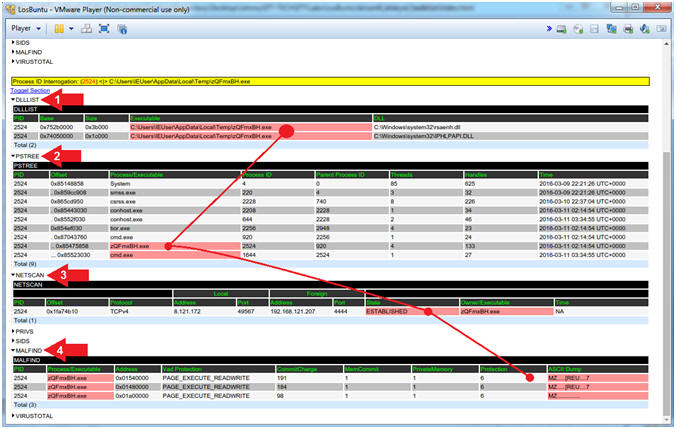 Meterpreter sessions are difficult to track, because they use DLL injections by inserting code into a running process. We are manually going to walk through various Volatility Plug-ins and dissect the ramifications of DLLs used; Child Processes spawned; Privileges Gain; Security Identifiers acquired and inherited; and Malware positively identified. Then, we will visually connect the dots using a Perl script to automate the Meterpreter Volatility Analysis to generate a report. DLL injection is a technique used for running code within the address space of another process by forcing it to load a dynamic-link library. 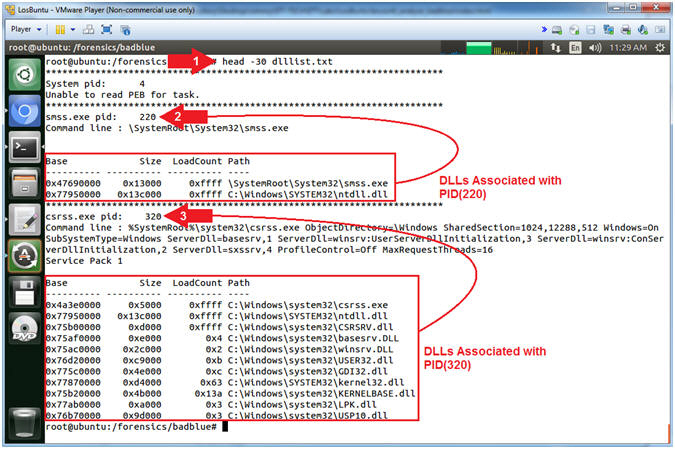 DLL injection is often used by external programs to illicit and influence an adverse behavior outside of the scope of the programs (eg., Webserver, FTP, VNC, Flash) original intent. Hunting for Reflective DLL Injection Libraries (IPHLPAPI.DLL and rsaenh.dll)? 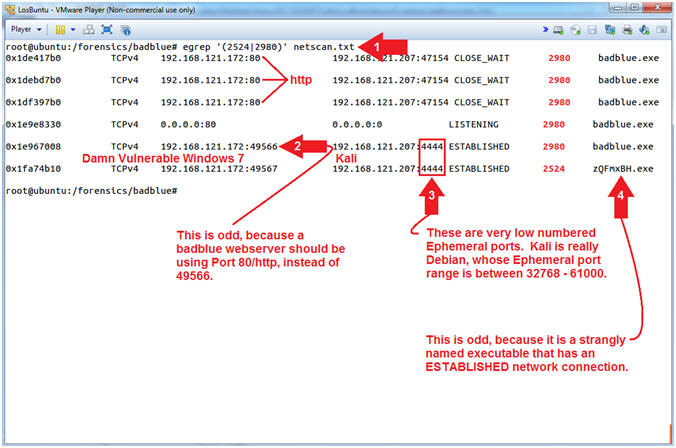 In Metasploit v3.3 and later, a Reflective DLL injection uses both IPHLPAPI.DLL and rsaenh.dll. (IPHLPAPI.DLL) is a Dynamic Link Library containing the functions used by the Windows IP Helper API. (rsaenh.dll) is a module that implements the Microsoft enhanced cryptographic service provider (CSP) that uses 128-bit encryption. An ephemeral port is a short-lived transport protocol port for Internet Protocol (IP) communications allocated automatically from a predefined range by the IP software. It is used by the Transmission Control Protocol (TCP), User Datagram Protocol (UDP), or the Stream Control Transmission Protocol (SCTP) as the port assignment for the client end of a client�server communication to a well known port on a server. I wanted to thank my Cyber Heroes: Michael Hale Ligh(@iMHLv2), Andrew Case (@attrc), and Stephen Fewer(@stephenfewer). 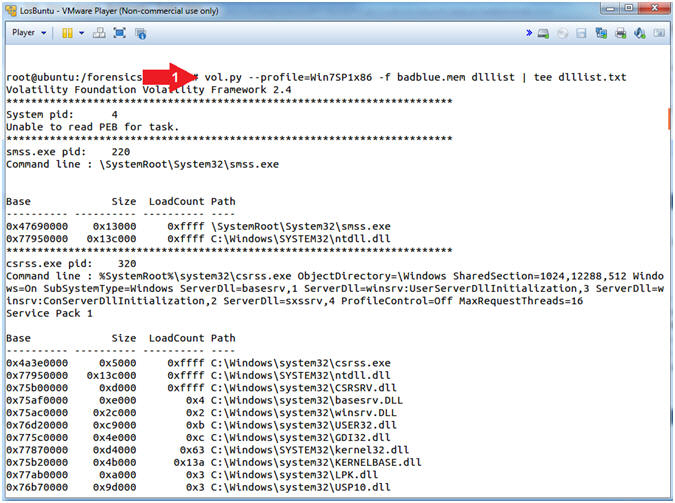 Use Volatility dlllist to search for IPHLPAPI.DLL and rsaenh.dll. Use Volatility pstree to recursively discover related processes. 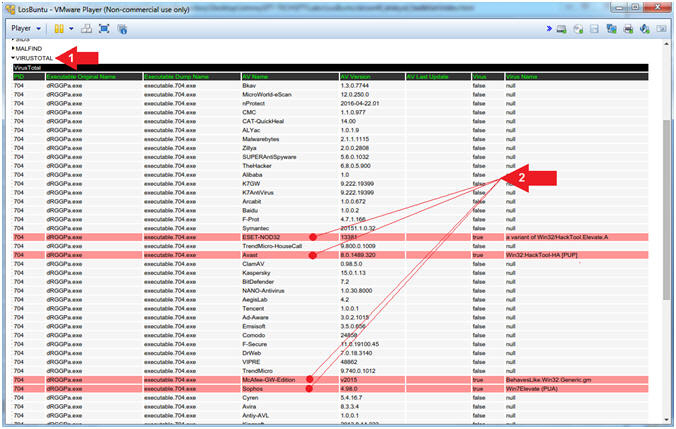 Use Volatility netscan to interrogate network connections. 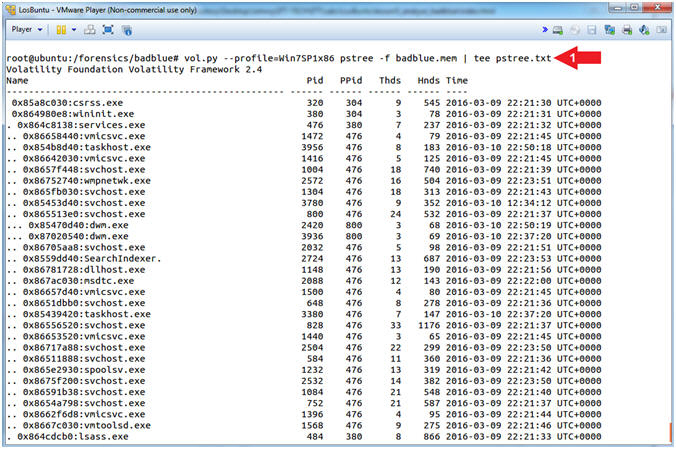 Use Volatility privs to view privileges associated with potentially malicious processes. 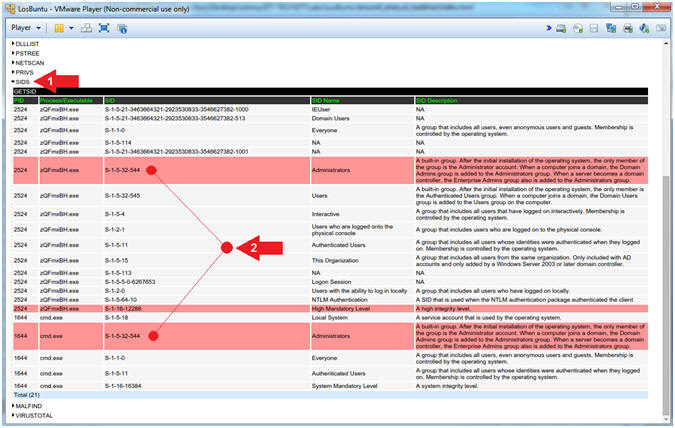 Use Volatility getsids to view security identifiers associated with potentially malicious processes. 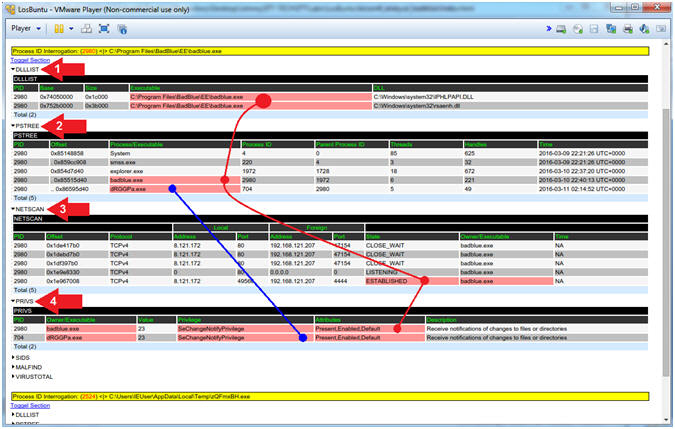 Use Volatility malfind to view VAD Protections and Executable Signatures. Use Volatlity procdump to extract process executable from captured image. Use VirusTotal to scan procdump extract for a malicious signature. LosBuntu will need 1.5 to 2 GB for this memory analysis. lo - Is the local loopback address. 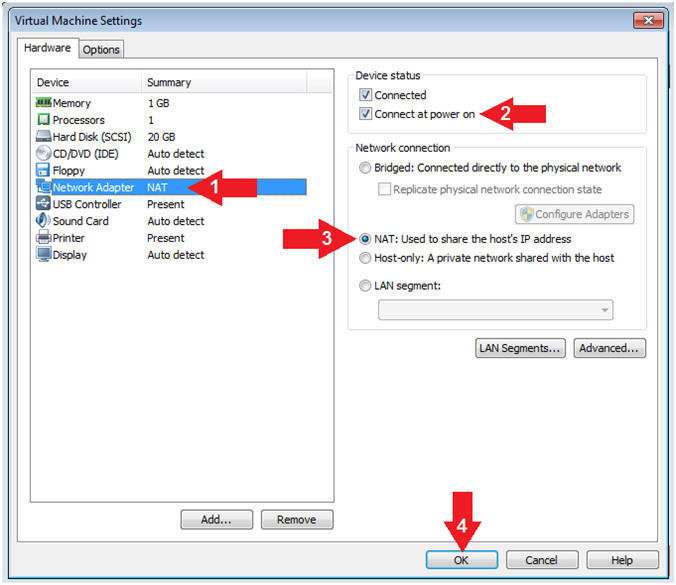 The loopback address is used to establish an IP connection to the same machine orbr.bbring used by the end-user. The loopback construct gives a computer or device capable of networking the capability to validate or establish the IP stack on the machine. 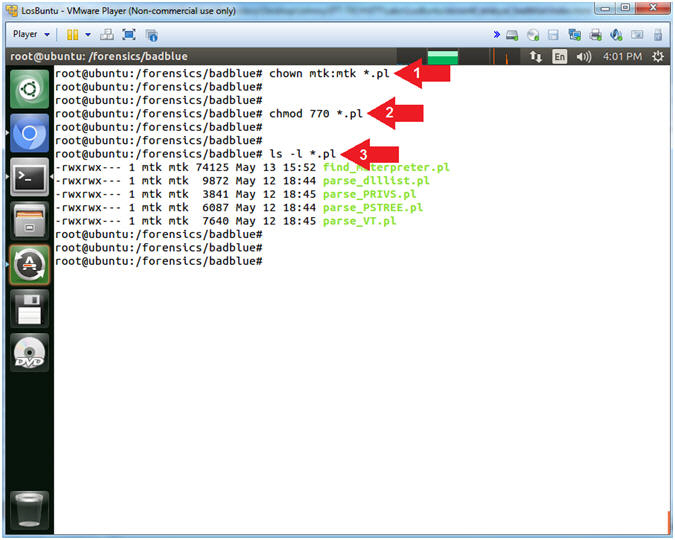 Command #1, Use (cd) to change directory into (/forensics/badblue). Command #2, Use (ls -l) to view the file (badblue.mem) details. E.g., Permissions(-rwxr--r--), Ownerships(root root), Byte Size, etc. 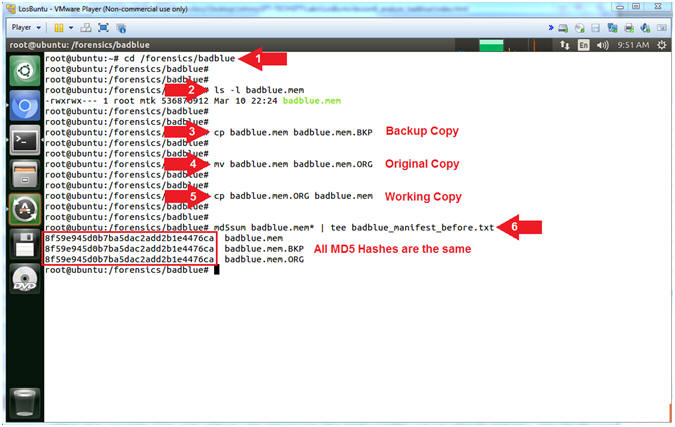 Command #3, Use (cp) to make a backup copy file (badblue.mem.BKP) of the original memory dump. Command #4, Use (mv) to rename the original memory file to (badblue.mem.ORG). 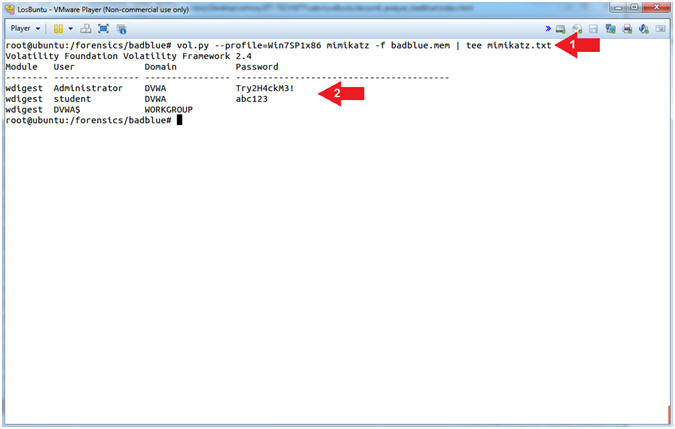 Command #5, Use (cp) to make a working copy (badblue.mem) of the original file (badblue.mem.ORG). Notice the modify time of badblue.mem.ORG. Command #1, Use (stat) to display the following attributes: Size, Permission Access (0744), User ID (root), Group ID (root), Access Time, Modify Time, and Change Time. Use (tee -a) to display and append(-a) the standard output to the already created file(badblue_manifest_before.txt). Command #2, Notice that (badblue.mem.ORG) has the oldest modify time, because it is indeed the original memory file. Going forward, if you need to make a new copy, you can use the (badblue.mem.BKP). We should preserve the (badblue.mem.ORG) by not accessing it, unless your have corrupted all of your other copies. 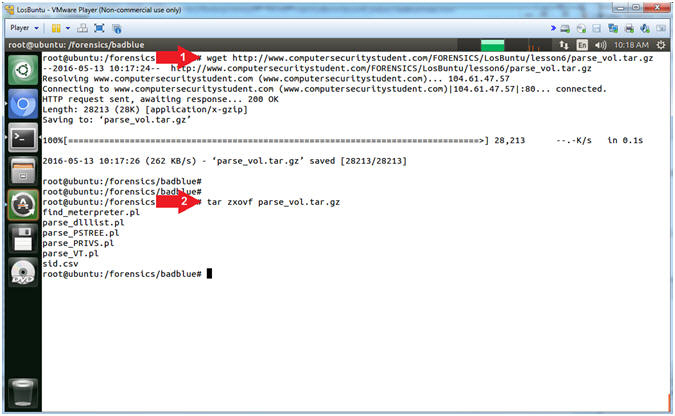 Command #1, Use (wget) to download the perl scripts (parse_vol.tar.gz). Command #2, Use (tar) to unzip(z), to extract(x), to not preserve ownership(o), in verbose mode(v), to specify file(f) for the tar file (parse_vol.tar.gz). Command #1, Use (chown) to change the ownership of both the user(mtk) and group(mtk) for all files that end with (*.pl). Command #2, Use (chmod) to change the permissions to where both the user(mtk) and group(mtk) have (read,write,execute) permissions. Where read + write + execute = 7. Command #3, Use (ls -l) to list all the files that end with (*.pl), where (*) is a wildcard. Record the right most suggested Volatility Profile. View the Image Date and Time. 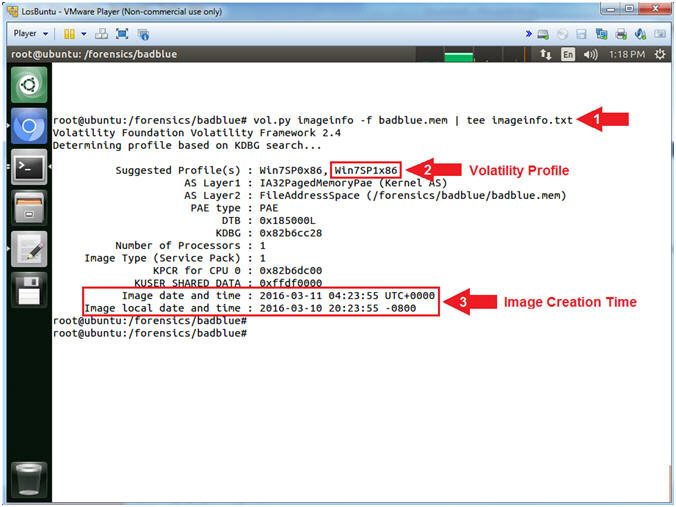 Command #1, Use (imageinfo) to ask Volatility to identify the Operating System Version of the image (badblue.mem). Command #2, Typically you will use the right most suggested Volatility Profile that is not in parenthesis. 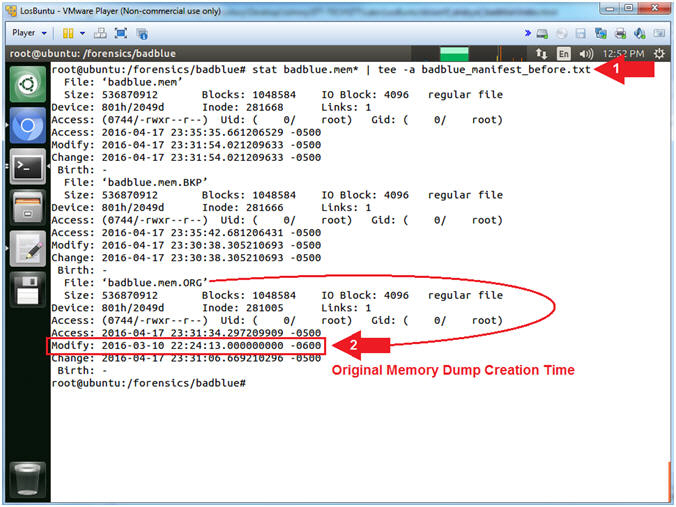 Command #3, If this was an image from a crash dump, then the highlighted time would reflect the crash dump time. Accordingly, this is the time the image was created. Command #1, Use (dlllist) to display the DLLs loaded for each process. Use (tee) to display and write standard output into a file called (dlllist.txt). Command #1, While ignoring case (-i), use (egrep) to search the file (dlllist.txt) for either (rsaenh.dll) or (IPHLPAPI.DLL). 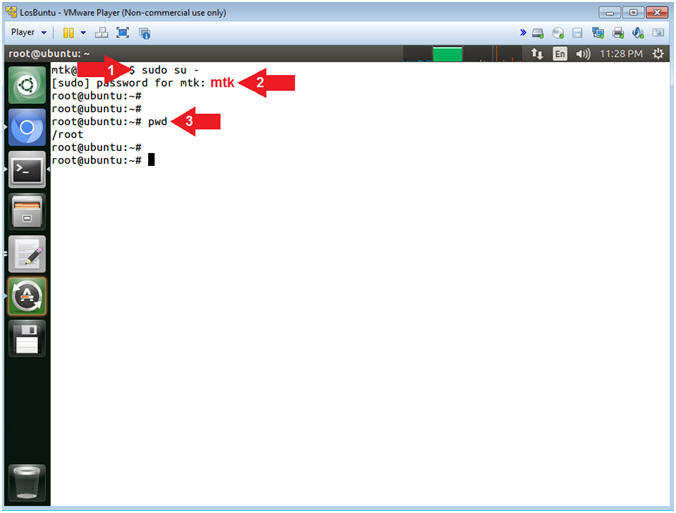 In Metasploit v3.3 and later, a Reflective DLL injection uses both IPHLPAPI.DLL and rsaenh.dll. (IPHLPAPI.DLL) is a Dynamic Link Library containing the functions used by the Windows IP Helper API. Obviously, there are a lot of processes that require network and encryption libraries. Command #1, Use (head -30) to display the first 30 lines of output contained in the dlllist.txt file. Instruction #2, In my case PID (220) belongs to process (smss.exe) which is using the ntdll.dll. Instruction #3, In my case PID (320) belongs to process (csrss.exe) which is using MANY DLLs. Wouldn't it be nice to be able to not only associate and format each DLL with it's Process ID, but also to display only those Process IDs using specific DLLs? (See Next Step). 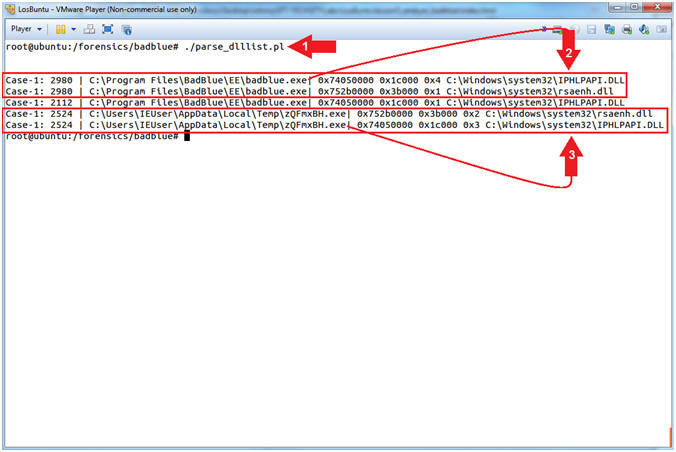 Command #1, Use (parse_dlllist.pl) to search the dlllist.txt for the following two DLLs: IPHLPAPI.DLL and rsaenh.dll. The output will be displayed in the following format: PID, Process/Executable, DLL Entry. In my case PID (2908) is associated with the (badblue.exe) webserver that was exploited in a previous lesson. Record your badblue.exe Process ID! In my case, PID (2525) is an oddly named executable (zQFmxBH.exe) running out of the Temp directory (C:\Users\*\Appdata\Local\Temp\). 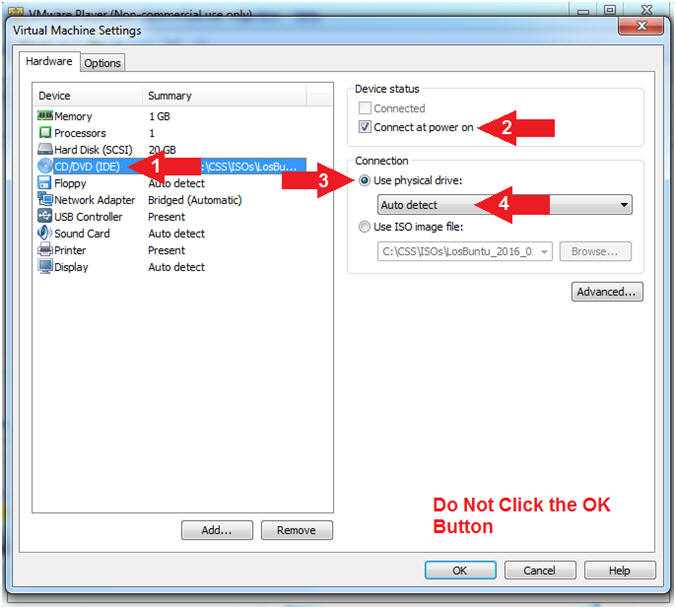 Record your zQFmxBH.exe Process ID! (parse_dlllist.pl) will only display programs that are using either IPHLPAPI.DLL -OR- rsaenh.dll, which are not contained in the following white list. Command #1, Use (pstree) to view the process listing in tree form. This enumerates processes using the same technique as (pslist). Note, it will not show hidden or unlinked processes. Child process are indicated using indention and periods. Use (tee) to display and write standard output to the file (pstree.txt). Replace the Process ID (2524) related to the oddly named executable (zQFmxBH.exe) with your PID found in [Section 6, Step 4]. 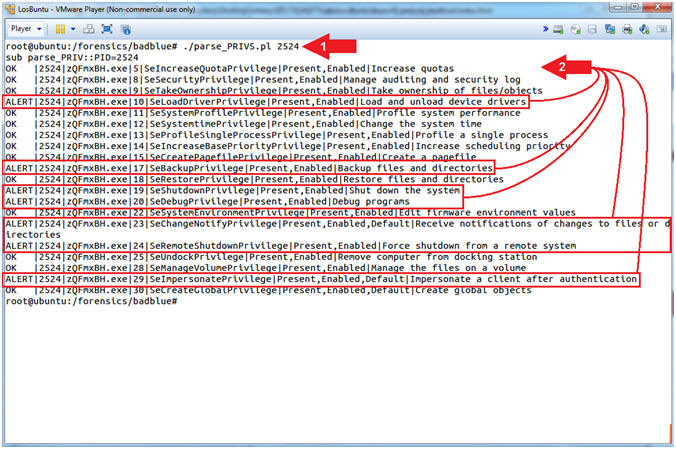 Replace the Process ID (2980) related to the badblue.exe executable with your PID found in [Section 6, Step 4]. Command #1, Use (egrep) to search the file (pstree.exe) for the PID (2524) or (2980). 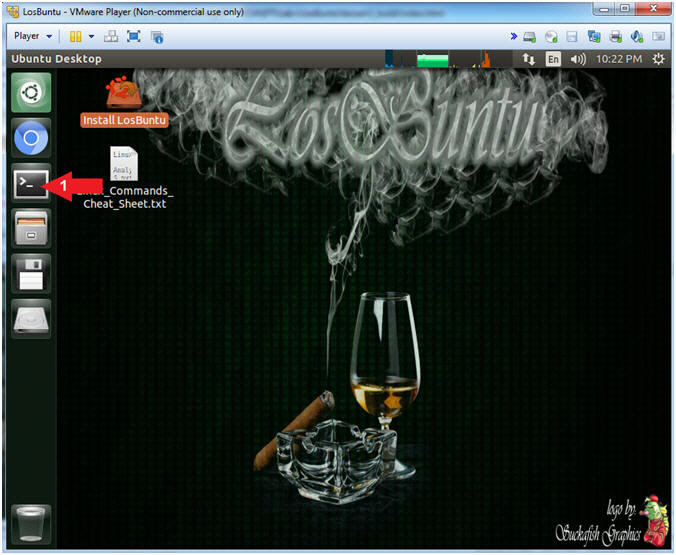 zQFmxBH.exe (2524) is the stager associated with (exploit/windows/local/bypassuac). 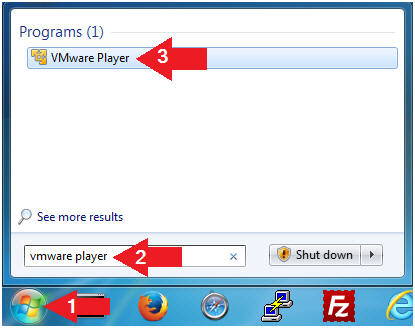 Remember this module is used to bypass the Windows User Account Control (UAC). Notice it spawned a command prompt. badblue.exe (2980) spawned another oddly named executable (dRGGPa.exe), which is the stager associated with the badblue exploit (exploit/windows/http/badblue_passthru). Wouldn't it be nice to be able to see all the Parent and Child Processes associated with (badblue.exe) and (zQFmxBH.exe)? Command #1,#3, Use (parse_PSTREE.pl) to search the contents of (pstree.txt) for all the Process IDs associated with (2524) and (2980). Command #1, Use (netscan) to scan for network artifacts in 32-bit and 64-bit Windows Vista, Windows 2008 Server and Windows 7 memory dumps. This finds TCP endpoints, TCP listeners, UDP endpoints, and UDP listeners. It distinguishes between IPv4 and IPv6, prints the local and remote IP (if applicable), the local and remote port (if applicable), the time when the socket was bound or when the connection was established, and the current state (for TCP connections only). Use (tee) to display and write standard output to a file (netscan.txt). Replace the Process ID (2524) related to the oddly named executable (zQFmxBH.exe) with your PID found in [Section 6, Step 4]. The executable (zQmxBH.exe) will be named different in your case. Notice the ESTABLISHED badblue.exe connection. Notice the low number Ephemeral Ports (4444). 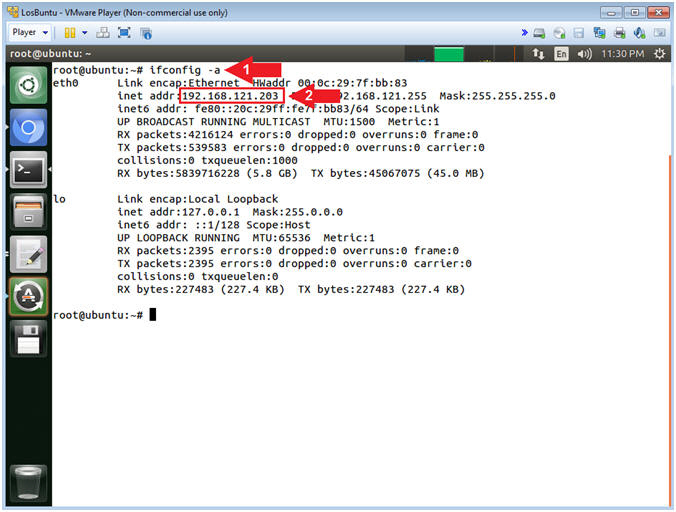 Command #1, Use (egrep) to search the file (netscan.txt) for any line that contains PID(2524) or PID(2980). Instruction #2, This is a red flag, because the badblue.exe webserver "should" only listen on Port 80. 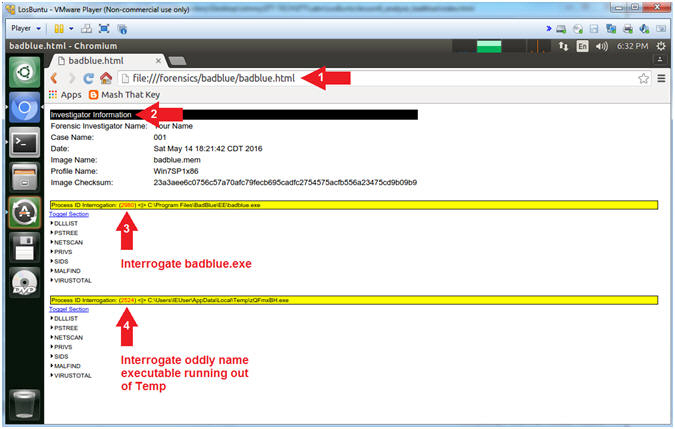 In this case, badblue.exe has an ESTABLISHED connection using an Ephemeral Port. Ephemeral Ports are used by the particular operating system for short lived IP communications using either TCP or UDP. 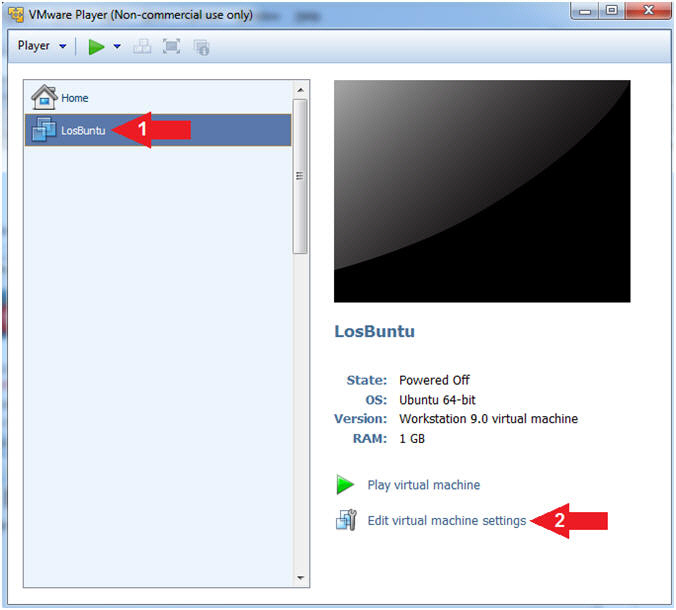 Instruction #3, this is the inverse situation in which the remote machine (Kali) should be using an Ephemeral Port between 32768 to 61000 to view a webpage. But, instead there are two ESTABLISHED connections on Port 4444. 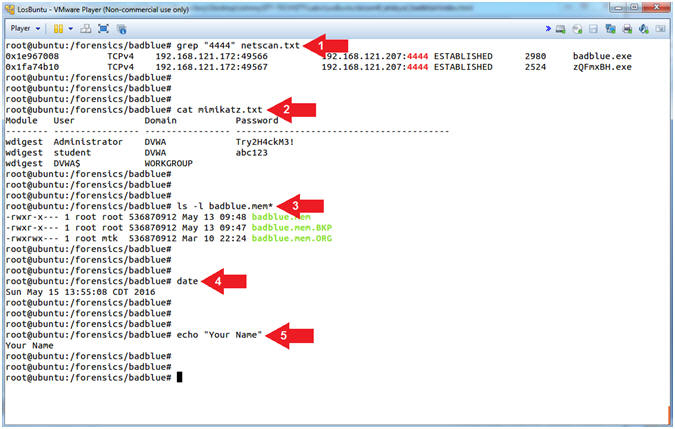 Remember, we attacked badblue.exe using (exploit/windows/http/badblue_passthru) on SESSION 1. Then, we escalated the privilege, using (exploit/windows/local/bypassuac), which is associated with (zQmxBH.exe) in my case. Instruction #4, ask yourself this question, why is there an oddly named executable that has an ESTABLISHED connection on a weird looking ephemeral port that is also ESTABLISHED to the same port badblue.exe is using? 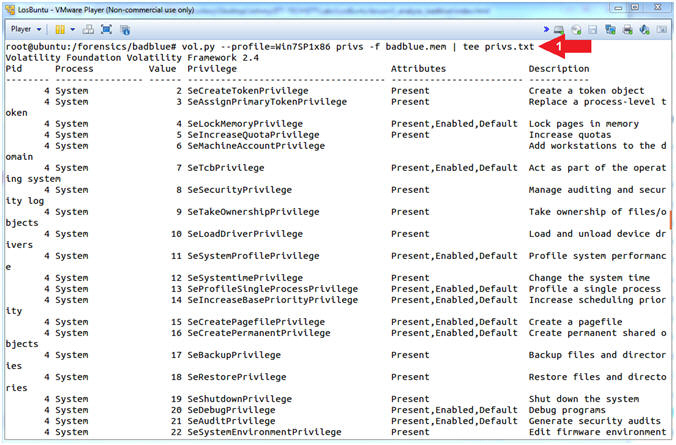 Command #1, Use (privs) to show you which process privileges are present, enabled, and/or enabled by default. Use (tee) to display and write standard output to a file (privs.txt). Privileges determine the type of system operations that a user account can perform. (Learn More). grep " 2524 " privs.txt | grep -i ",enabled"
Command #1, Use (grep) to search the file (privs.txt) for the PID string ( 2524 ). Where the ( )represents a white pace. Use (grep -i) to search the results that the first (grep) command produced for the string (,enabled). If a privilege is (Enabled) for a particular process then that process has the ability to exercise the actions that come with those privileges. For verbose detail surrounding each privilege see Privilege Constants. Replace the Process ID (2524) related to the oddly named executable (zQFmxBH.exe) with your PID found in [Section 4, Step 4]. Notice the ALERTs associated with some of the privileges. 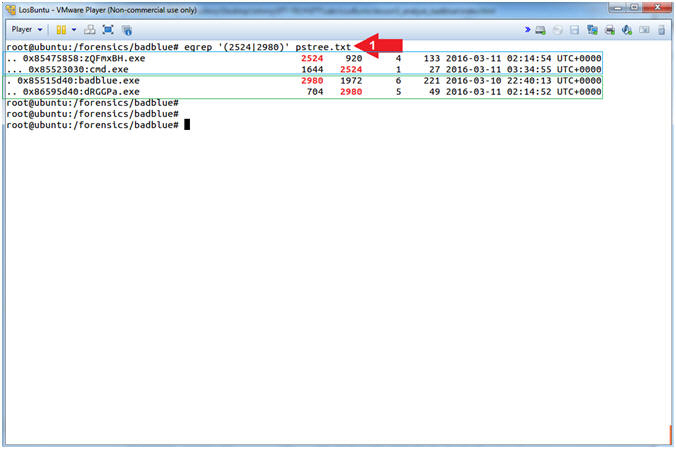 Command #1, Use (parse_PRIVS.pl) to search the file (privs.txt) for any privileges related to PID (2524). According to The Art of Memory Forensics (Pages 171-172), A forensics investigator should be most concerned with the following privileges that have explicitly been enabled. SeBackupPrivilege: This grants read access to any file on the file system, regardless of its specified access control list (ACL). Attackers can leverage this privilege to copy locked files. SeDebugPrivilege: This grants the ability to read from or write to another process� private memory space. It allows malware to bypass the security boundaries that typically isolate processes. Practically all malware that performs code injection from user mode relies on enabling this privilege. SeLoadDriverPrivilege: This grants the ability to load or unload kernel drivers. SeChangeNotifyPrivilege: This allows the caller to register a callback function that gets executed when specific files and directories change. Attackers can use this to determine immediately when one of their configuration or executable files are removed by antivirus or administrators. SeShutdownPrivilege: This allows the caller to reboot or shut down the system. Some infections, such as those that modify the Master Boot Record (MBR) don�t activate until the next time the system boots. Thus, you�ll often see malware trying to manually speed up the procedure by invoking a reboot. 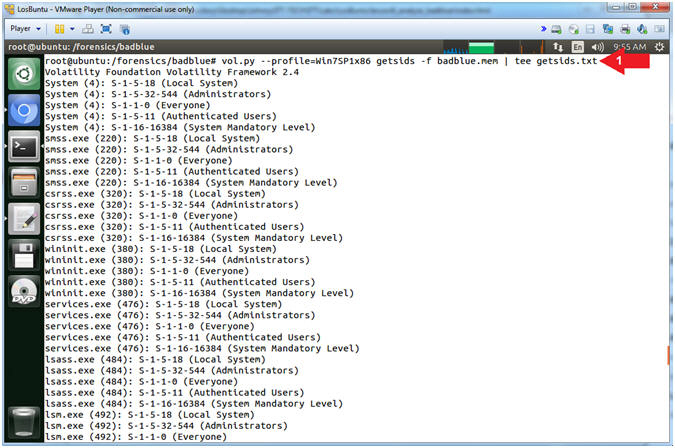 Command #1, Use (getsids) to view the SIDs (Security Identifiers) associated with a process. 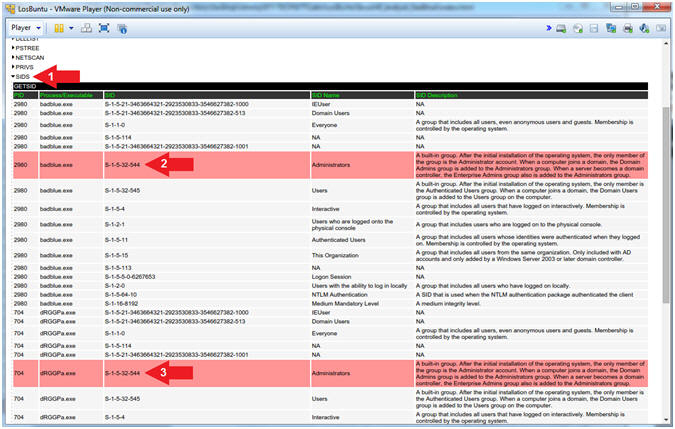 This can help you identify processes which have maliciously escalated privileges and which processes belong to specific users. Command #1, The getsids.txt output contains Executable name followed by (Process ID) followed by the Security Identifier. Here we use (egrep) to search the file (getsids.txt) for any line that contains PID(2524) or PID(2980). Furthermore, we need to actually search for each PID inside of parenthesis, otherwise egrep might include a SID that contains either 2524 or 2980. In order to include parenthesis in the search, we must remove the meaning of the of the parenthesis, which tells egrep to actually search for the parenthesis along with the PID. By playing a forward slash \ infront of a parenthesis you remove the parenthesis' meaning to egrep. 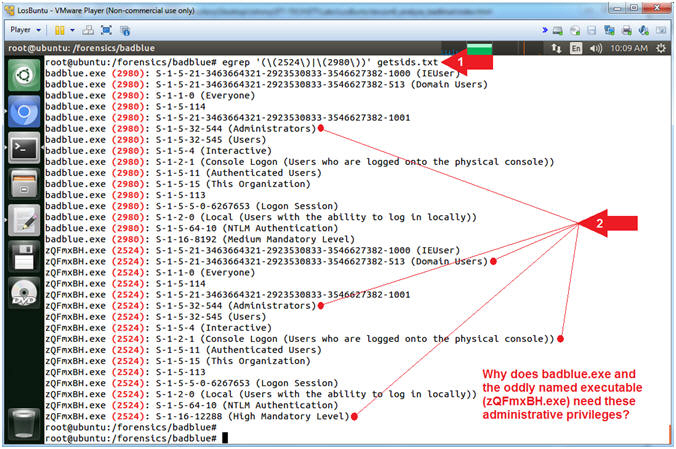 GETSIDS tells you what level of access the attacker had or gained. Below are some of the most commonly attacked SIDs. SID Name (Administrators): This is a built-in group. 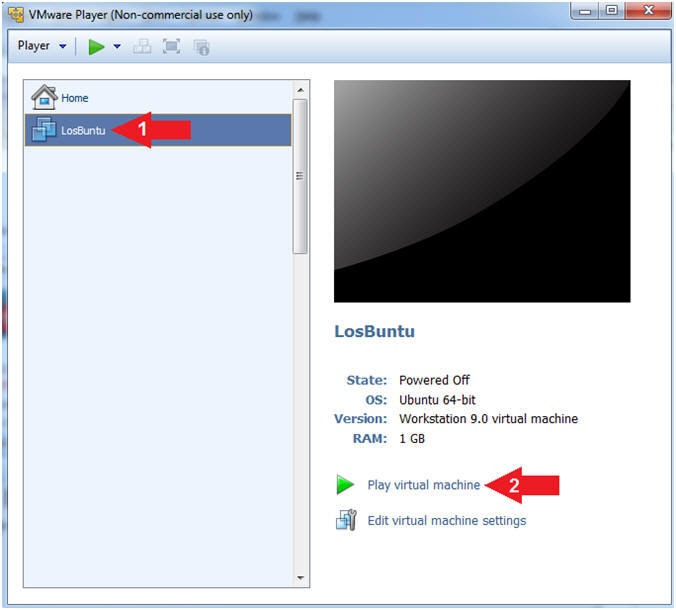 After the initial installation of the operating system, the only member of the group is the Administrator account. When a computer joins a domain, the Domain Admins group is added to the Administrators group. When a server becomes a domain controller, the Enterprise Admins group also is added to the Administrators group. SID Name (Domain Users): A global group that, by default, includes all user accounts in a domain. When you create a user account in a domain, it is added to this group by default. Red Flags should be going off and you should be asking why does the oddly named executable running out of the Temp directory need SIDs associated with Administrators, Domain Users, or Physical Console Access? 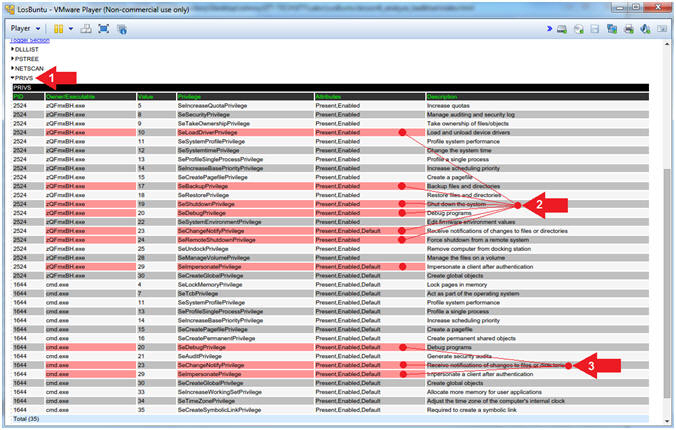 Command #1, Use (malfind) to help find hidden or injected code/DLLs in user mode memory, based on characteristics such as VAD tag and page permissions. Use (tee) to display and write standard output to a file (malfind.txt). Command #1, Use (malfind) and the (-pPID) flag to to display only output associated with the oddly named executable (zQmxBH.exe) associated with the Process ID (2524). Instruction #2, its' VAD Tag Character has the ability to read, write and execute instructions from its' particular memory location. 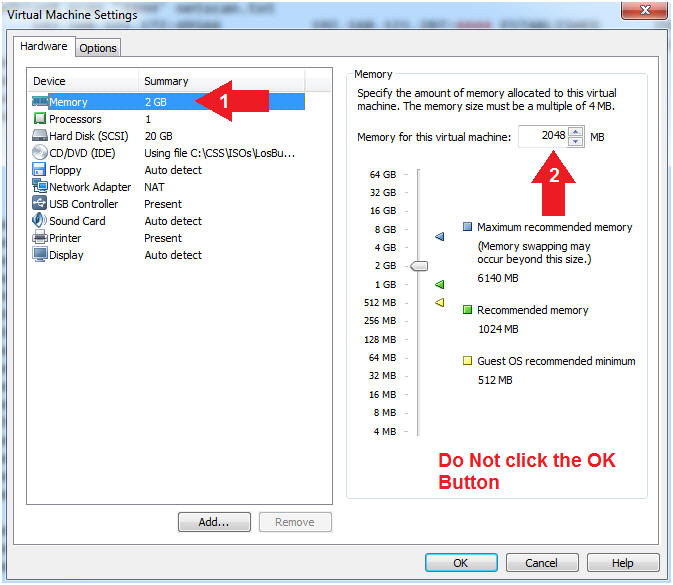 VAD refers to the Virtual Address Descriptor for the Windows Memory Tree Structure. Instruction #3, The DOS MZ executable format is the executable file format used for .EXE files in DOS. The file can be identified by the ASCII string "MZ" (hexadecimal: 4D 5A) at the beginning of the file (the "magic number"). "MZ" are the initials of Mark Zbikowski, one of the developers of MS-DOS. Command #1, Use (prodump) to dump a process's executable for a Process ID specified by (--pid=PID), where (--dump-dir=/directory) provides the destination directory of the dumped executable. Command #2, Use (ls -l) to view the file (executable.2524.exe) details. E.g., Permissions(-rwxr--r--), Ownerships(root root), Byte Size, etc. 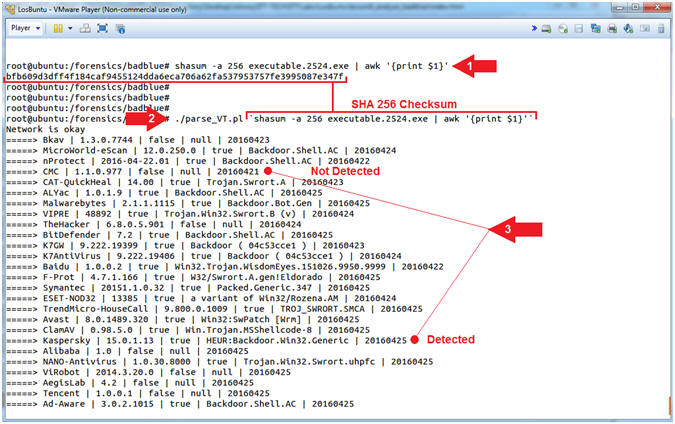 Command #3, Use (shasum -a 256) to create a SHA 256 check sum of the file (executable.2524.exe). Command #4, View the SHA Checksum output. This step will not work, unless you completed the prerequisite lesson listed below. 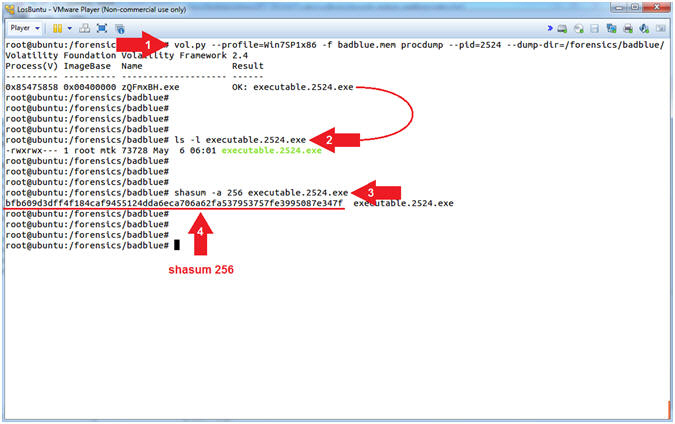 Command #1, Use (shasum) to generate a SHA 256 checksum of the executable (executable.2524.exe) that procdump generated. Use (awk) to cut out the first column (print $1) of the checksum data that is returned from the (shasum) command. Command #2, Use (parse_VT.pl) to remotely query VirusTotal to see if the checksum of the of the suspicious executable (executable.2524.exe) that was created by procdump is indeed a Virus. Instruction #3, If the third column is equal to false, then the particular scanner checksum database did not find a malicious signature. In the inverse, If the third column is equal to true, then the particular scanner checksum database did find a malicious signature. 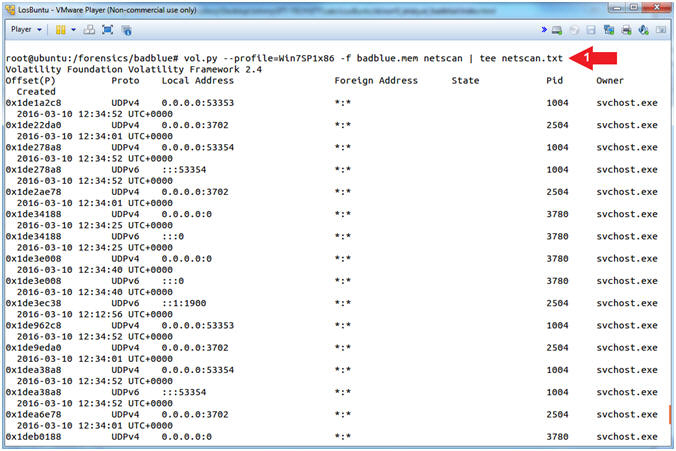 Command #1, (find_meterpreter.pl) was written by Computer Security Student, LLC (Profess0R Shaieb) to automate the parsing and formatting of Volatility data and to help visualize the connecting of the dots. These Perl scripts are meant as teaching aids to help students acquire a programming skillset. Forensics Investigator Name, (2) Case Name, (3) Date, (4) Image Name, (5) Profile Name, and (6) Image Checksum. The Next Section Interrogates the BadBlue executable because it using the following DLLs: (rsaenh.dll) and/or (IPHLPAPI.DLL). The Next Section Interrogates the Oddly Named executable because it using the following DLLs: (rsaenh.dll) and/or (IPHLPAPI.DLL). Remember that we are searching for possible Meterpreter sessions, because it's injection signature has been know to use (rsaenh.dll) and (IPHLPAPI.DLL). In addition, both badblue.exe and the oddly named (zQmxBH.exe) are not in our white list. In your case, (dRGGPa.exe) will be name differently with a different PID. Red Dot Analysis (badblue.exe), badblue.exe was flagged because it is using (rsaenh.dll) and/or (IPHLPAPI.DLL), which is seen in DLLLIST. In PSTREE, you can see that badblue.exe is the Parent ID of another oddly named executable (dRGGPa.exe), which is the stager associated with the badblue exploit (exploit/windows/http/badblue_passthru). In NETSCAN, notice that (badblue.exe) has ESTABLISHED a TCP connection back to Kali(192.168.121.207) over Port/4444. In PRIVS, notice that SeChangeNotifyPrivilege is turned on by (default, present and enabled) which allows the caller/attacker to register a callback function that gets executed when specific files and directories change. Blue Dot Analysis (dRGGPa.exe). In PSTREE, notice that dRGGPa.exe is a Child Process of (badblue.exe). 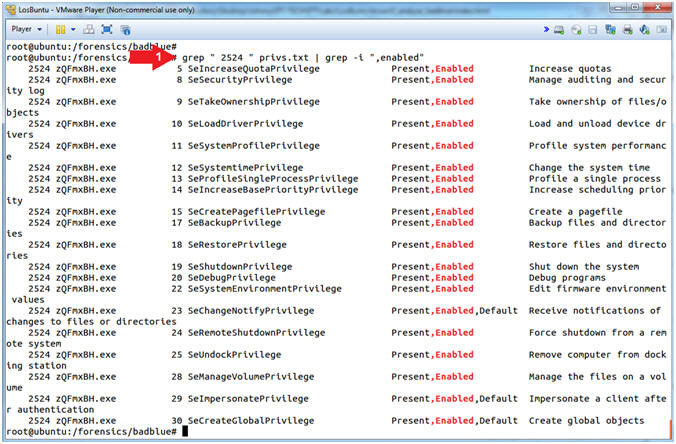 In PRIVS, it also has SeChangeNotifyPrivilege turned on by (default, present and enabled). Nothing running out of Temp should ever have this privilege to alert somebody if a file or directory changes. SID (S-1-5-32-544) Analysis. 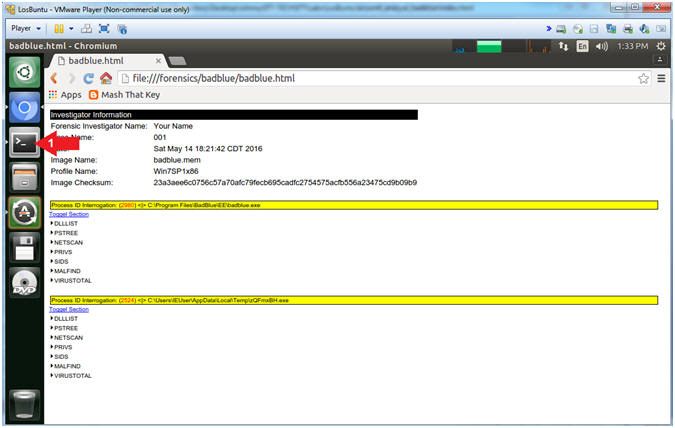 The BadBlue executable is attached to an Administrator owned Security Identifier. This is a big problem, because, once exploited, the attacker owns the machine. Notice that (badblue.exe) spawned a child (dRGGPa.exe) that also belongs to the Administrators Security Identifier. Never install a public utility like a Webserver with Administrator Privileges. Obviously, thorough regression and penetration testing is required for any public utility that might be susceptible to buffer overflows. 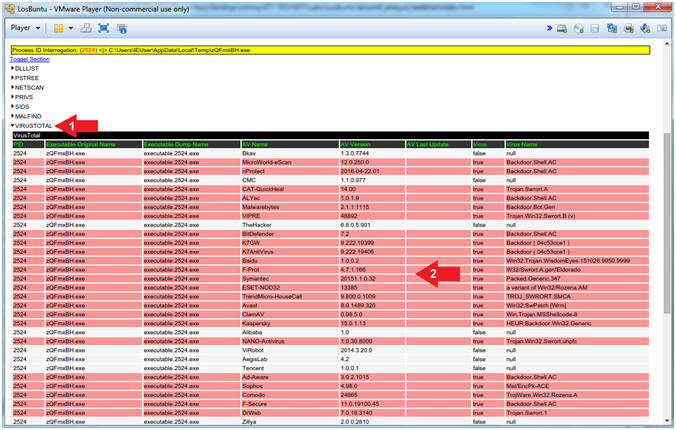 Notice that several Anti-Virus Vendors associate (dRGGPa.exe) with a positive Malware identification. My Process ID (2524) is related to the oddly named executable (zQFmxBH.exe) which is found in [Section 6, Step 4]. In a previous lesson, we escalated the privilege, using (exploit/windows/local/bypassuac), which is associated with (zQmxBH.exe) in my case. Red Dot Analysis (badblue.exe). 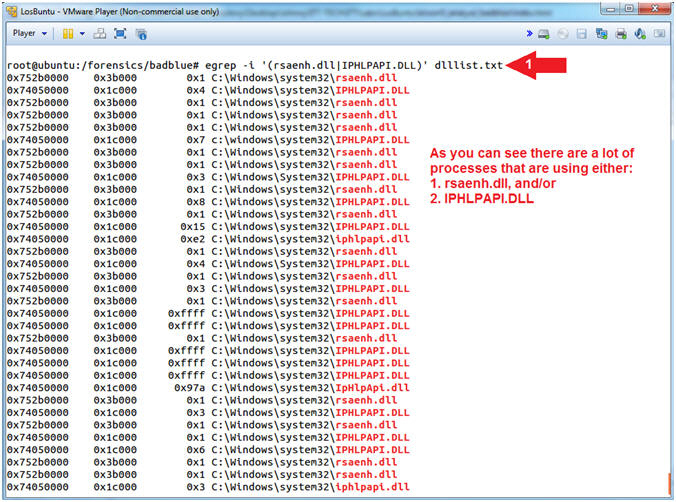 (zQmxBH.exe) was flagged because it is using (rsaenh.dll) and/or (IPHLPAPI.DLL), which is seen in DLLLIST. In PSTREE, we can see that (zQmxBH.exe) spawned a child process (cmd.exe) which is part of the post exploit(bypassuac). In NETSCAN, notice that oddly named process (zQmxBH.exe) that is running out of Temp, which also has an ESTABLISHED TCP connection back to Kali(192.168.121.207) over Port/4444. MALFIND, also flagged (zQmxBH.exe), because of its' VAD Tag Character has the remote ability to read, write and execute instructions from its' particular memory location. 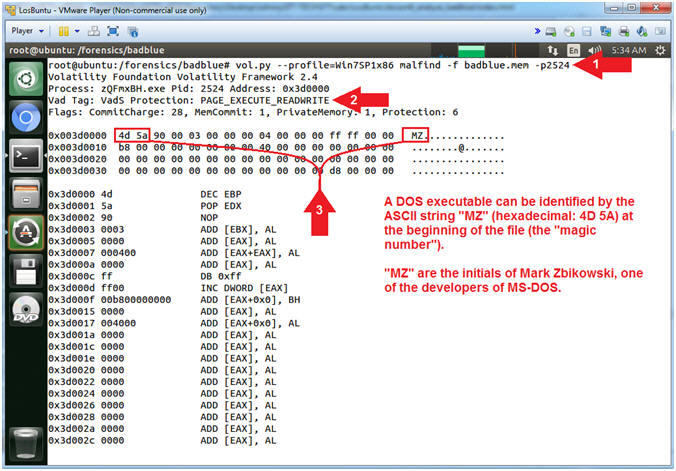 In addition, you can see that (zQmxBH.exe) has the presence of the MZ executable signature. In summary, this is an executable running out of Temp that is using both using (rsaenh.dll) and (IPHLPAPI.DLL), which has a remote connection back to somewhere else. Notice the privileges associated with (zQmxBH.exe). Notice the privileges associated with (cmd.exe). Instruction #2, Ask yourself why this oddly named executable has the privilege (ie., ability) to remotely shutdown (SeShutdownPrivilege) the machine or has the ability to load and unload device drivers (SeLoadDriverPrivilege). Instruction #3, We should already be concerned by this cmd.exe process, because it was spawned from (zQmxBH.exe). Ask yourself why it needs to Receive notifications of changes to files or directories (SeChangeNotifyPrivilege) or to impersonate a client after authentication (SeImpersonatePrivilege). Notice the Security Identifiers associated with (zQmxBH.exe) and (cmd.exe). Instruction #2, Why would both the oddly named executable (zQmxBH.exe) running out of Temp and it's child process (cmd.exe) need to have or belong to the Administrator Security Identifier. Notice the positive Malware Identifications associated with (zQmxBH.exe). Instruction #2, In summary, the oddly named executable (zQmxBH.exe) (1) running out of Temp (2) with an ESTABLISHED TCP connection back to Kali (3) over a low number Ephemeral Port/4444 (4) with High-Level Privileges and (5) an Administrative Security Identifier is (6) positively identified as Malware by numerous Anti-Virus Vendors. Command #1, Clicking on the Terminal Window icon will display your previous Terminal Window, if you already did not close it. Command #1, Use (mimikatz) to display both the usernames and passwords of anybody logged onto Damn Vulnerable Windows 7 at the time the image was captured. Instruction #2, From Windows XP to Window 2K8 Server, clear text passwords of logged in users are stored in memory even if they are using Active Directory. Command #1, Use (grep) to search for the string(4444) in the file (netscan.txt). 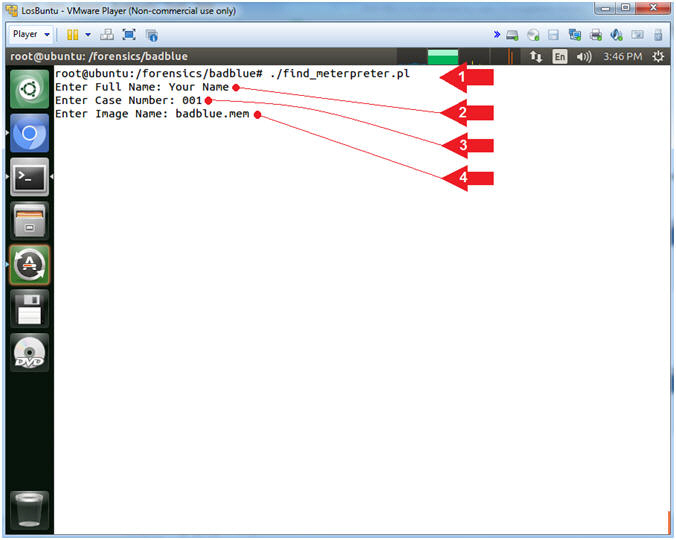 Command #3, Use (ls -l) to display the file details of all the badblue.mem images.